ANOTHER SUCCESSFUL DESTINATION AND HOLIDAY SHOW! MANILA, Philippines— Lucio Tan-led flag carrier Philippine Airlines (PAL) is now a 4-star airline. 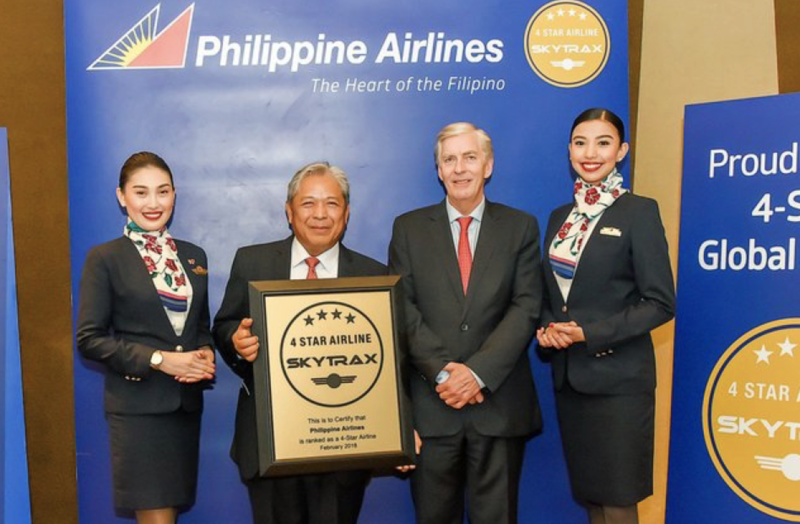 International air transport rating organization Skytrax certified PAL as a 4-star airline, after it conducted an audit of the airline’s in-flight and on-ground service and noted major enhancements to its end-to-end passenger experience, PAL announced on Thursday, February 8. The airline, which joins 40 other airlines in th category, is the first Philippine airline to receive the 4 star rating from London-based Skytrax, which audits airport and airlines, and ranks airlines worldwide for staff service standards and product quality. The Skytrax Certified Airline Star Ratings, awarded since 1999, are internationally recognized as a global benchmark of airline standards. “This recognizes the great improvements that [PAL] has introduced over the last two years, both in terms of product change and development and enhancement of the front-line staff service,” said Skytrax CEO Edward Plaisted. “New and retrofitted aircraft have played an important part in the quality improvement process, and this looks set to develop further when PAL introduces the A350 into their fleet,” Plaisted added. In June 2017, PAL placed sixth on the list of the World’s Most Improved Airlines, and was ranked by Skytrax as 67th out of 320 airlines, reflecting a 16-notch increase in rankings from 2016. “The rating upgrade is a key result of a multi-year top-to-bottom end-to-end enhancement of the Philippine flag carrier. Our ‘Get That Star’ journey began in 2016. Our efforts over the last two years have borne fruit,” said PAL president and COO Jaime Bautista. From 2016 up to the present, PAL finalized fleet orders of Airbus A350s, A321s, Boeing 777s, and Bombardier Q400 Next Generation planes bringing its fleet count to 88 aircraft, the largest fleet in the country. PAL also developed new domestic hubs in Clark, Cebu, and Davao, and introduced new international routes from Clark to Seoul, South Korea, and Cebu to Bangkok, Thailand, and Chengdu and Beijing in China, among routes. For the in-flight experience, the airline added myPAL eSuite personal TV service that gives passengers access to a wide selection of movies, music, and TV shows; and also myPAL Player which provides in-flight entertainment using passengers’ own devices, as well as in-flight Wi-Fi. PAL also renovated the inter-terminal transit lounge at its NAIA Terminal 2 hub, improved its business class check-in product, introduced more efficient boarding procedures. and put up airport terminal signage for passenger convenience. The airline said that its next step is to open a new two-level, 1,250-square-meter International Mabuhay Lounge at NAIA Terminal 2 for members of its frequent flyer program and business passengers by the second quarter of 2018. PAL also said it plans to launch new routes, including non-stop services to New York and Brisbane, and flights to India and additional routes to Japan and China in 2018. MANILA, Philippines — Foreign arrivals have breached the government’s 6.5-million target for 2017, according to data from the Department of Tourism. DOT achieved its goal despite falling short of its one million target for Chinese arrivals. A total of 6.62 million foreign tourists visited the Philippines last year, up 11 percent from 2016. South Korea remained the country’s top source market for 2017, accounting for 1.6 million arrivals or an increase of nine percent from the previous year. Following South Korea is China as 968,447 Chinese visited the Philippines last year, up 43 percent. For this year, Tourism Secretary Wanda Corazon Teo said the DOT was looking at hitting two million Chinese arrivals. “We continue to welcome more Chinese tourists to the country as part of the improved diplomatic relations between Manila and Beijing since President Rodrigo Duterte’s state visit to China last year,” Teo said. Apart from China, India also saw a significant rise in arrivals at 18.13 percent to 107,278. This is over the DOT’s 100,000 arrivals target for India. India closed the year as the country’s top 12 source market. Other markets in the top five are US (9957,813 arrivals), Japan (584,180), and Australia (259,433). Other top source markets were Taiwan, Canada, United Kingdom, Singapore, Malaysia and Hong Kong. Story from The Philippine Star. 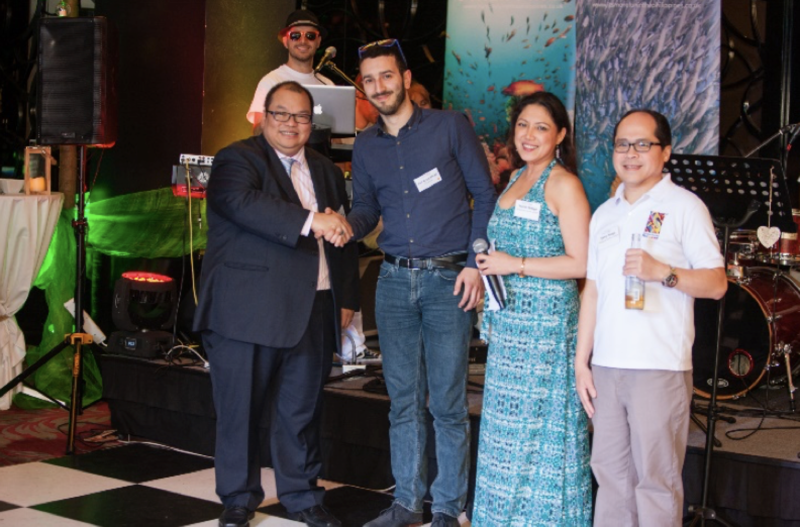 The Philippine Department of Tourism (PDOT) London hosted an exciting chic beach party for the Meetings, Incentives, Conferences and Events (MICE) specialist agents, professional association leaders and diplomats on 31 January 2018. Held in the Danzier Suite at The Mayfair Hotel in London, the evening provided MICE attendees with a flavour of the Philippines. Guests learned about MICE market offerings while they enjoyed a selection of Philippine food and cocktails made with premium Philippine brand Don Papa rum, to performances from a live and cultural dance troupe. 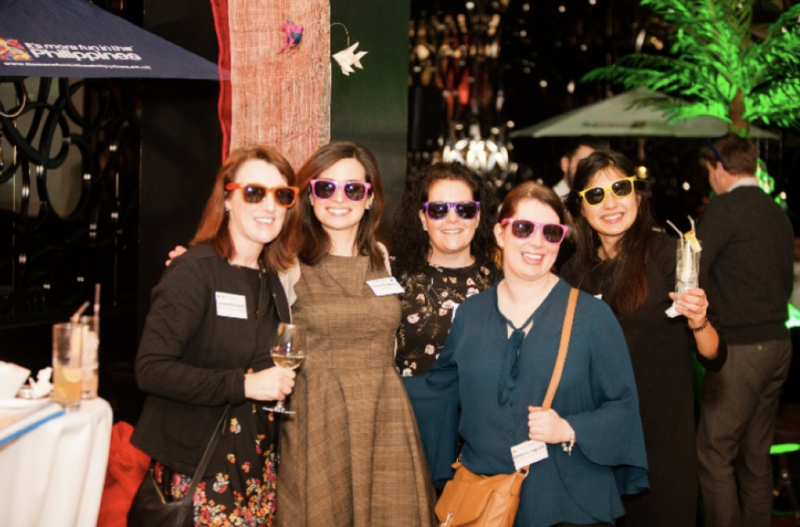 With a ‘chic beach party theme’, guests experienced the Philippine-style fun and said goodbye to January Blues by wearing sunglasses while dancing the night away and singing with a live band! Everyone took part in the fun games such as the limbo and traditional Filipino style paper dances. Prize for the games included bottles of Don Papa rum and dinner vouchers for London’s go-to restaurant for authentic Philippine cuisine, Romulo Café. Attendees at the event included representatives from WRG Live, Reed & Mackay, Barclays PLC, Citigroup and HSBC, among others. 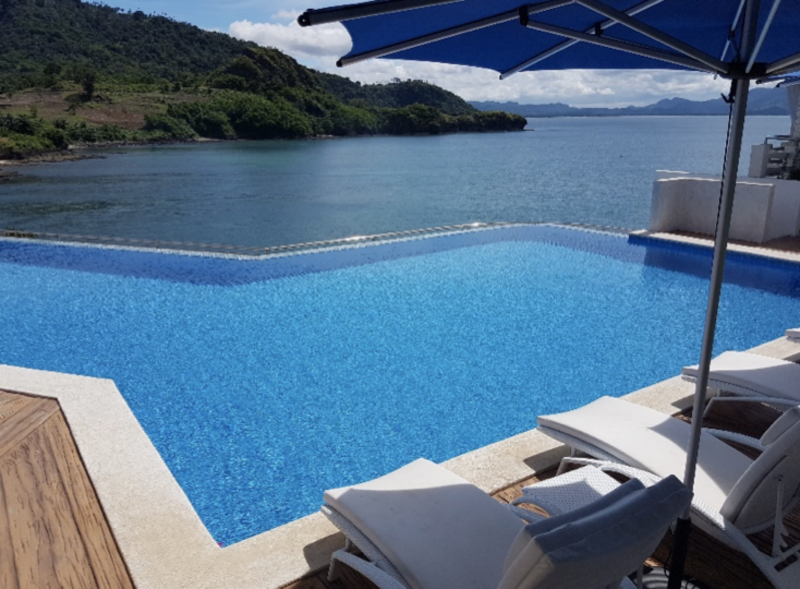 During the night, PDOT London raffled off a Holiday for two to the Philippines, sponsored by Makati Diamond Residences, Camsur Watersports Complex (CWC) and Caramoan Islands, and was presented by the Philippine Embassy’s Consul General, Senen Mangalile, and Tourism Attaché, Gerard O. Panga. to TFI Group’s Project Manager, Rui Cruz Alves. The Philippines’ world-class MICE venues are surprisingly cost-effective for events and the country is quickly becoming a well-established global centre of commerce. Situated in Southeast Asia, the Philippines is an archipelago made up of more than 7,000 island and alongside luminous white-sand beaches, the country’s modern cities boast dazzling nightlife hotspots and a wide range of sightseeing possibilities for groups. The Philippines is a top MICE destination in Southeast Asia. For more information please email info@itsmorefuninthephilippines.co.uk. The Philippines Department of Tourism (PDOT) London office once again joined the biggest travel show in London dedicated to consumers. 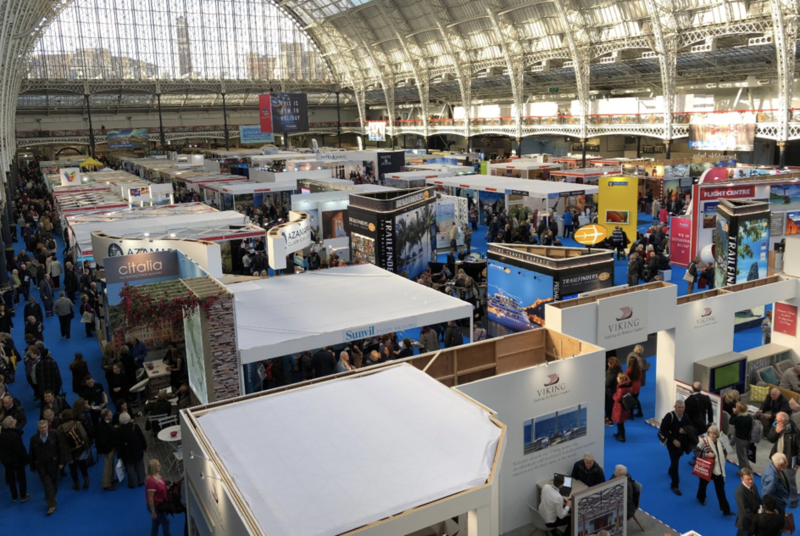 Destinations: The Holiday and Travel Show welcomed more than 70,000 travel enthusiasts during the 4-day show in Olympia, London, during the first week of February. “It’s now the 25th year of the show and the Philippines is one of the earliest participants in this showcase of destinations” said Tourism Attache, Gerard O. Panga. True Filipino hospitality is renowned worldwide. Makati Diamond Residences embodies this culture with a dedicated team working together to create seamless experiences for the business traveller. Aside from the drive to deliver invaluable service and guest satisfaction, expect nothing less than the new standard of luxury living when staying at Makati Diamond Residences. Situated at the Central Business District, Makati Diamond Residences is conveniently located surrounding your next commerce, leisure or dining destination. Across Greenbelt, a few steps away from Ayala Avenue, and within 7 kilometers from the international airport, the property is the perfect location for a productive and meaningful trip, whether for business or leisure. 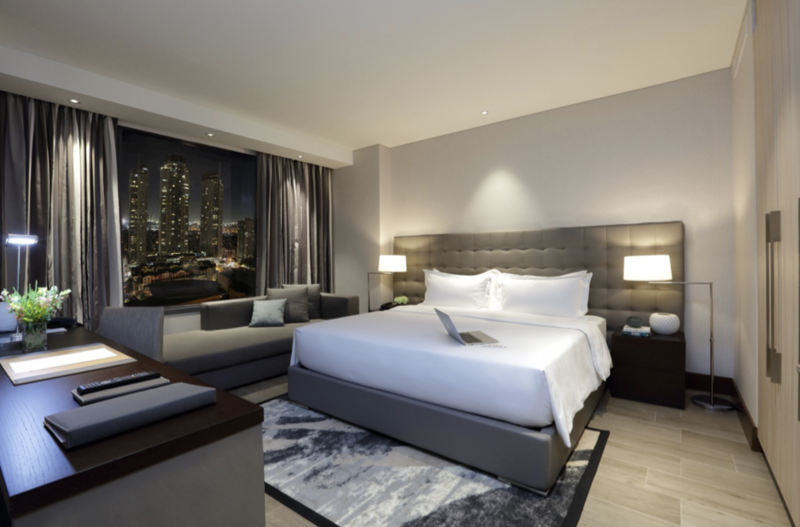 All 410 luxury guestrooms have European and Filipino furnishings from Calligaris, Bo Concept and Las Palmas, with room interiors in neutral palettes and modern design. Each unit is outfitted with special features and amenities that complement an overnight or extended stay, including a fully-equipped kitchenette with a convection stove, microwave or oven, refrigerator and a selection of cooking tools and utensils. A washer and dryer unit, 55”LED television and large shower and bath areas are also available. Stay inclusions offer flexible breakfast packages, complimentary Wi-Fi and local calls, a complimentary minibar, and 50% discount on admission fees to Ayala Museum. Larger room categories also have a dishwasher, walk-in closet, an office and entertainment area, and access to the Club Lounge. Makati Diamond Residences offer additional guest services and amenities to cater to the guest’s comfort and convenience. A Business Center is ready to assist the working travellers’ demands for administrative requirements such as incoming and outgoing facsimile, photocopying, printing and scanning services, and private meeting areas for group discussions. To cultivate a balanced lifestyle, a range of health and wellness amenities are present, including a 24 hour gym, daily TRX classes at the TRX studio, an indoor lap pool, a spa, a clinic, and a yoga studio, available for rent. With long-term residents in mind, Makati Diamond Residences offers a unique amenity giving guests the flexibility of availing their breakfast privilege outside of the property. The Dining Card gives guests additional dining options through its 19 partner restaurants, taking advantage of being at the best location in Manila. Get the privilege of doing away with the morning queue or maximizing your stay inclusions at your desired occasion and location, for breakfast lunch or dinner. Dining privileges are loaded daily and accumulate your unused balance, giving you extended credit for use at Wildflour Cafe + Bakery, Mary Grace Cafe, Bizu Patisserie, Toby’s Estate, Pancake House, and Max’s Restaurant, among others. Open 24 hours, Alfred offers a curated ala carte selection of Continental cuisine and seasonal buffets. Guests may expect a harmony of flavors in every dish with highlights including U.S. Prime Ribeye Steak, Grilled Duo of Chilean Seabass and Scallop, and Manila Clams and Spicy Pork Chorizo Linguine. Alfred is proudly featured in the Philippine Tatler’s Best Restaurants Guide 2017 and was awarded as the Champion of the Great Banquet Challenge in the 2017 Philippine Culinary Cup, led by Executive Chef Merlinda Junio. Baked, the ground floor cafe, offers freshly made sandwiches, salads and signature pastries and cakes including the Diamond Ube Ensaymada, Baked Cheesecake, Supermoist Chocolate Cake and a selection of specialty ice cream. Other items offered include pastries from Eric Kayser and beverages from Toby’s Estate and TWG Tea. The hotel also offers a premium collection of whiskies, liquors, wines and expertly made standard cocktails, available at the Whiskey Bar and Pool Bar. Makati Diamond Residences offers the perfect canvas for any occasion, whether for a grand event or intimate affair. With a luxury ballroom seating up to 400 guests, exquisite themed menus, and impeccable service, delivering a unique Diamond Experience may be expected. Makati Diamond Residences holds a total of 1,500 square meters of function space with unique venues including an executive boardroom, kitchen studio, and an outdoor roof deck. All packages are tailor fit to suit any occasion. On 29 January 2018, Time Out, the leading global media and entertainment brand that inspires and enables people to make the most of the city, has announced that Romulo Café London has been selected for a Time Out Recommended Award 2017. The award reflects the fact that Time Out editors consider Romulo Café London to be one of the best of its kind in London. The award is reserved for places which have been reviewed and awarded four or five stars, or been specially recommended by Time Out critics. It celebrates what Time Out considers the best venues in the city. Rowena Romulo, owner of Romulo Café London, said, ‘My colleagues and I are extremely proud to have been selected for a Time Out Recommended Award 2017. ‘Since we opened Romulo Cafe London, we have all worked very hard to make fine Filipino cuisine recognised and enjoyed by a wider international audience. This means focussing one hundred percent on the quality of our food and service, and making sure we always do our best to do even better. Romulo Cafe London was opened less than 2 years ago by Rowena Romulo and Chris Joseph as the first international branch of the Romulo family’s successful restaurant business in Manila. Their aim was to bring ‘a taste of the Philippines to the heart of Kensington’ while paying homage to the memory of Rowena’s grandfather, the late Filipino statesman and diplomat, Carlos P. Romulo. Romulo Café in London is located at 343 Kensington High Street W8 6NW. It is open 7 days a week, from Monday to Sunday, serving lunch, merienda and dinner. For more information on Romulo Café London, visit www.romulocafe.co.uk.